The World Climate Research Programmes (WCRP) Global Energy and Water Exchanges (GEWEX) Data and Assessments Panel (GDAP) is currently running the initiative LandFlux aiming at deriving global land surface heat flux products that can be used together with the remaining GEWEX endorsed satellite products to allow a comprehensive observation-based analysis of the water and energy cycle. These GEWEX efforts are supported by related activities from programs such as the ESA Water Cycle Observation Multi-mission Strategy project (WACMOS, as our current WACMOS-ET project) and the NASA Energy and Water cycle Study (NEWS). LandFlux is coordinating two interrelated research efforts that seek to: (i) intercompare long-term gridded surface flux data sets and identify their skill and reliability (i.e. product-benchmarking), and (ii) simulate and intercompare evaporation models to identify algorithms appropriate for developing a global flux product (i.e. model-benchmarking). Intercomparison efforts (LandFlux-EVAL), have resulted in some published product evaluations (Jimenez et al., 2011, Mueller et al, 2011) and the generation of a multi-year global merged benchmark synthesis product based on the analyses of existing land evaporation datasets (Mueller et al., 2013). This monthly product covers the periods 1989-1995 and 1989-2005, and can be downloaded from the LandFlux-EVAL website. Work in ongoing to produce a similar product at daily resolution and covering 1980-2010. Running a selection of evaporation models with forcings seeking consistency with other GEWEX products has resulted in a preliminary global latent flux product (see discussions about our preliminary v0 product at Jimenez et al, 2012 ). Current developments are focusing on a new version v1, with efforts concentrating on model evaluation (McCabe et al., 2015, Jimenez et al., 2015) and the completion of a 3-hourly 1987-2007 latent flux product (expected release by the end of 2015). Work is also ongoing in developing a sensible flux product to complete the description of turbulent fluxes at the surface. Comparison of the four global LandFlux V0 ET estimates with ET inferred from P-Q as estimated from a set of five global gridded precipitation datasets and the GRDC-WBM composite gridded runoff climatology. The grey shading represents the uncertainty in P-Q as quantified by the different precipitation datasets. 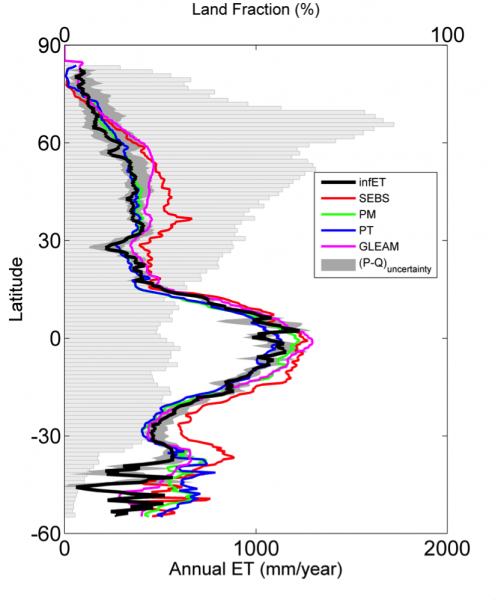 Horizontal bars show the fraction of land per latitude band. Reprinted from Jimenez et al., 4th LandFlux Workshop, GEWEX News, 22(4), 17-18, 2012.